…. where we had our first night aboard and aground in our new home. Before too long Special Delivery provided a splashdown for Calliope at Reading and we took charge! 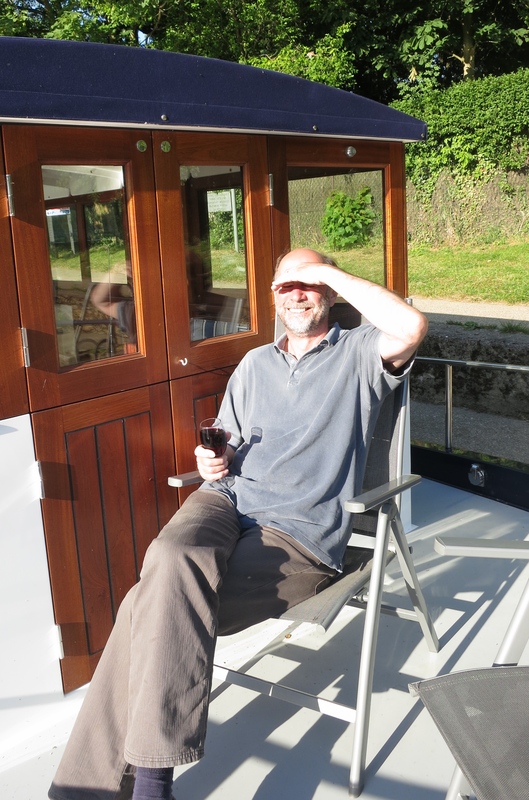 Life at the Marina was crowded, but fun, with Spring sunshine making a reluctant appearance on days when Stu and crew were alone ……. …. and disappearing when we had visitors aboard! This was our first family cruise, to Sonning, Feb 15th. The skies began to lighten, the days began to lengthen. 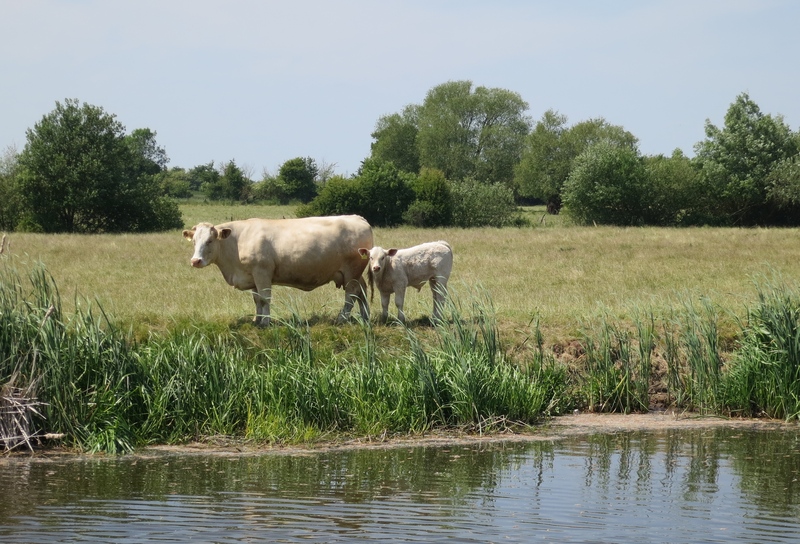 We began to explore the river, rurally up to Goring (three times – we like it there – good pub, beautiful weir, wonderful wildlife) …..
where Calliope was treated to a royal sail-by of the Queen’s ‘Gloriana’ on river trials for The Magna Carta 800th celebrations. 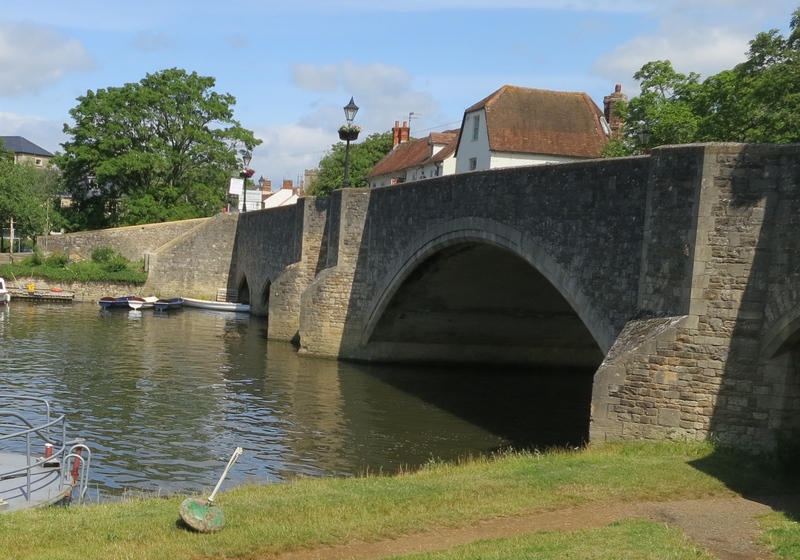 … to Richmond on the tidal Thames (where lurk river monsters and dangerous ‘Eddies’) …. 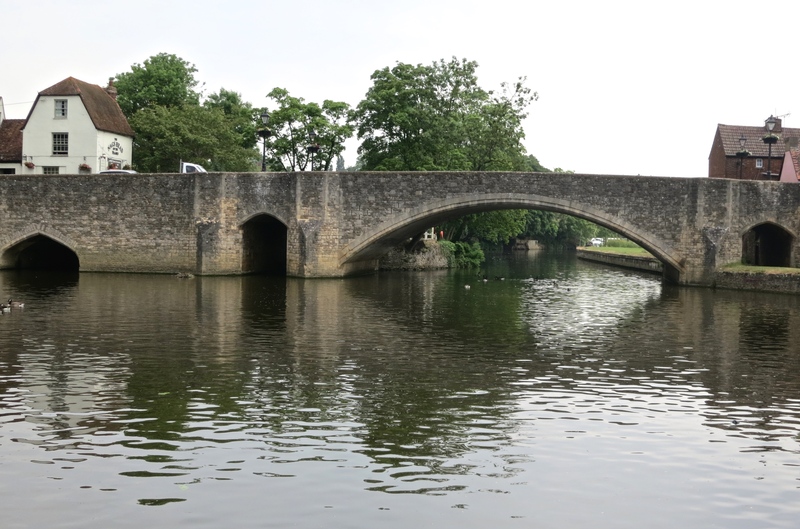 … under many bridges including Wallingford, a town of much history and beauty …. 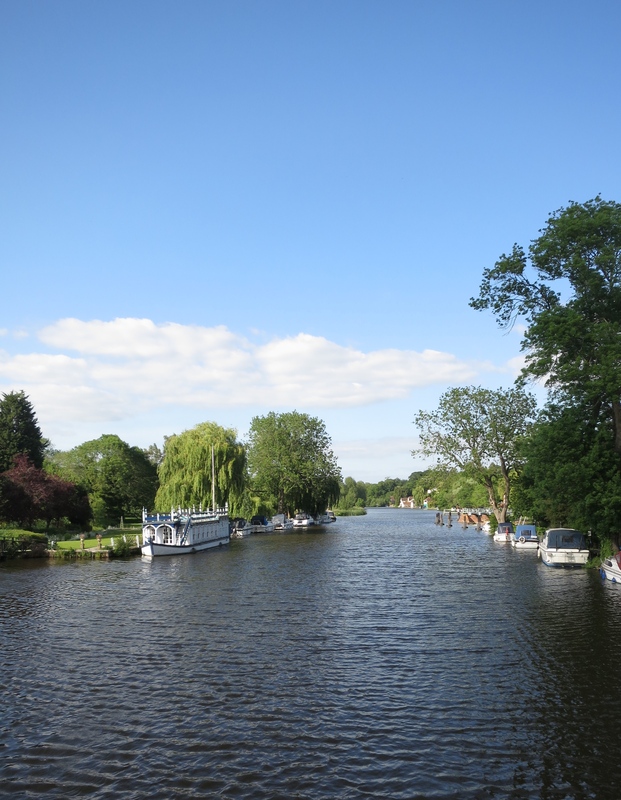 … past Henley, well before the Regatta …. … and the river-side buildings were grand. I have heard tell of brave consideration of a trip to Limehouse! 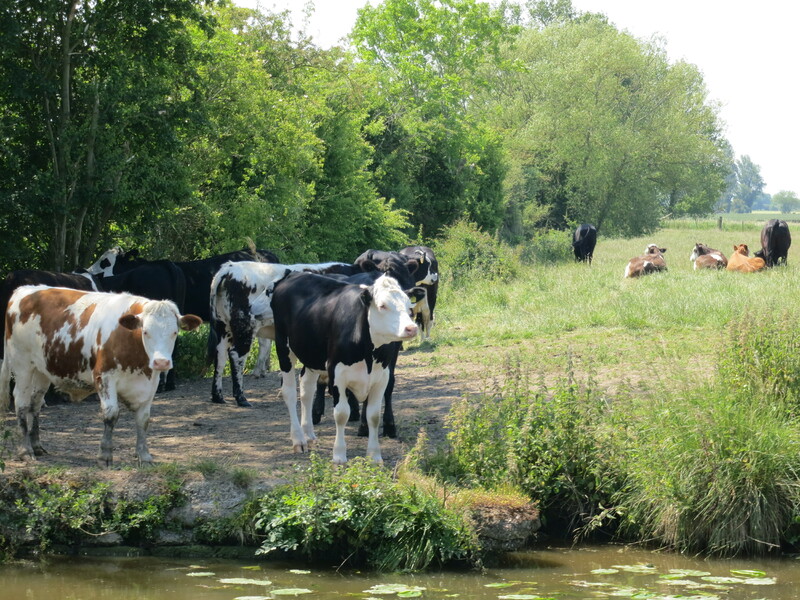 Found an unexpected, calm, mooring last night – Wargrave Marsh. Calliope is not listing to starboard – but the photographer may be! We were joined, cross stream, by a hunting heron. As the sun set a bedazzled goose came hopefully by. And the light graded gently through rainbow gold …. to pastel pinks, greys and blues. Quite often the surface of the river is silky smooth and the reflections are better than the real scenery I am amongst. 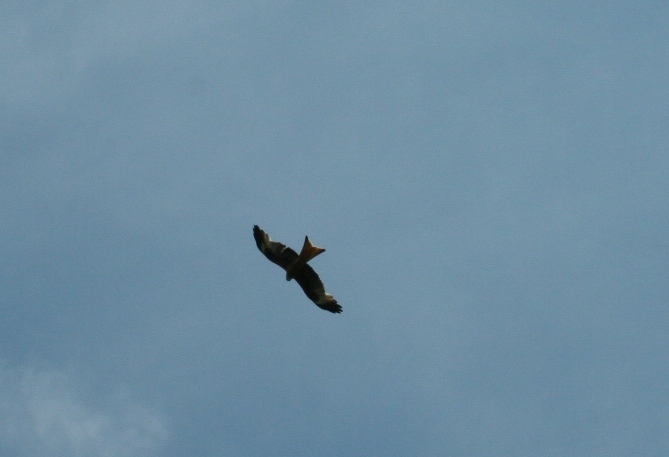 How about the above, today at Goring …. a true reflection, no trickery and just a simple Canon camera? And the larger view below, out across the river, with reflection on both sides. Then there were some stunning skies at Abingdon that were more than mirrored in the water. And this view across the river this evening, reflecting trees and clouds – no it is not upside down! It is what I could see from the boat. Finally, for now, the wavy reflection of 5 of Wallingford Bridge’s 17 (SEVENTEEN!) arches this morning as we left town. 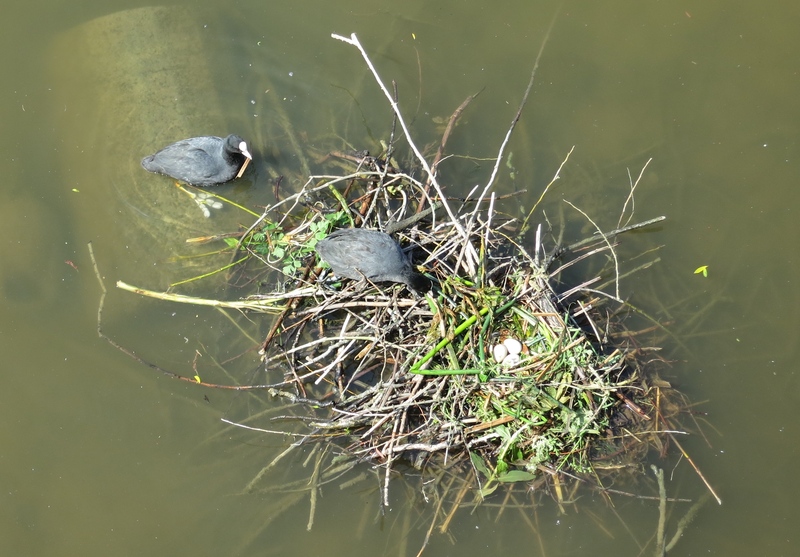 two coots have build their nest and three eggs have been laid within. 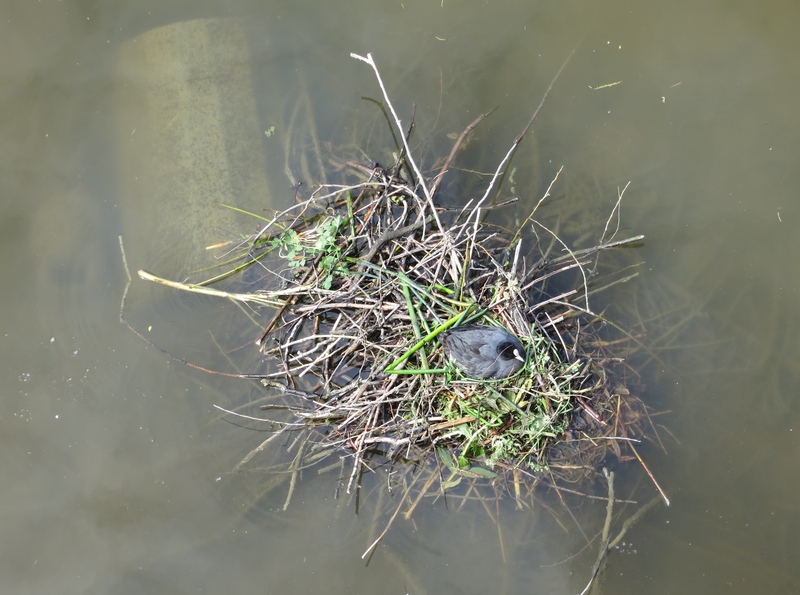 Mother coot sits on the nest hour after hour. 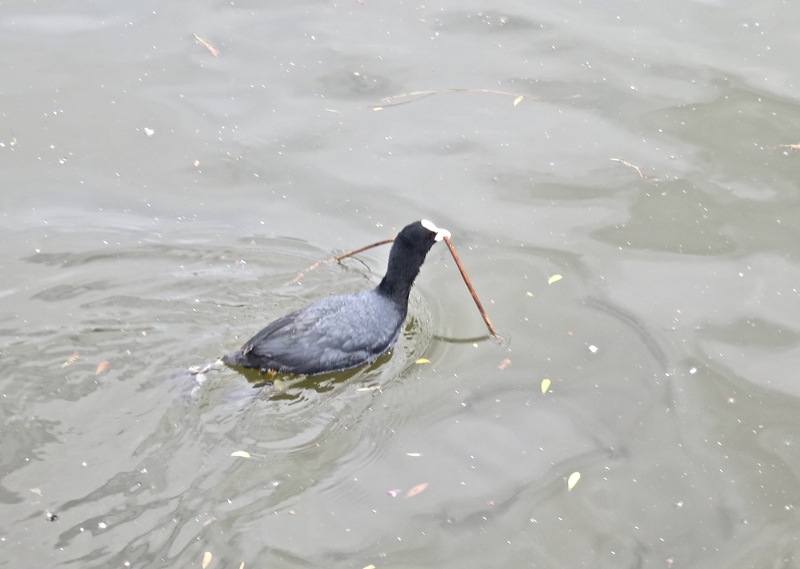 Father coot finds rushes and reeds to reinforce the nest before the eggs hatch. Together they prepare a home for their young. I hope they hatch out before we leave Abingdon! 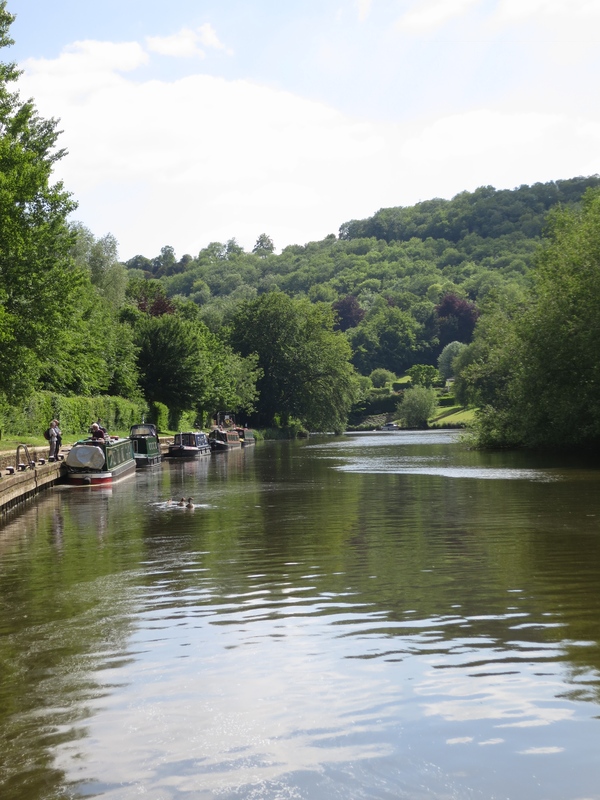 Alfred Tennyson’s line comes to me again and agin on the river. 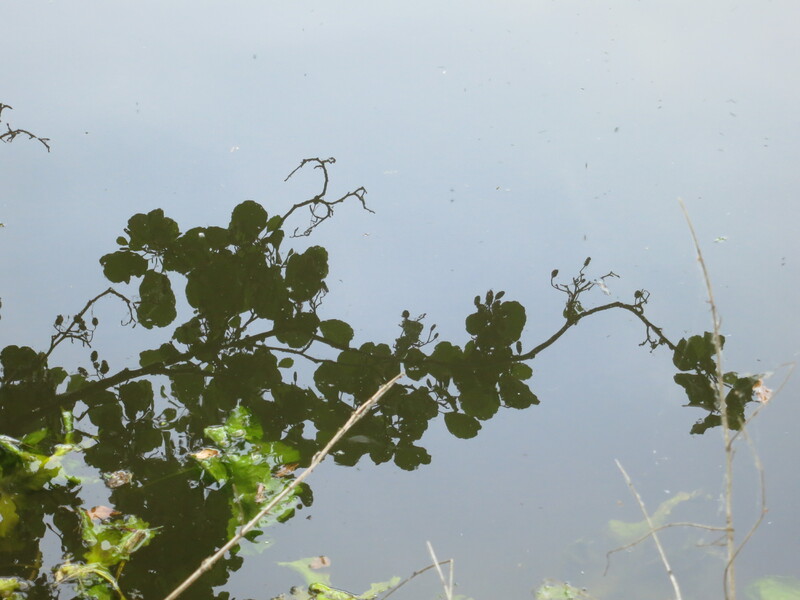 Although he was ‘speaking’ as a babbling brook, I find the line babbling in my mind and from my lips incessantly as I see the Thames birdlife. 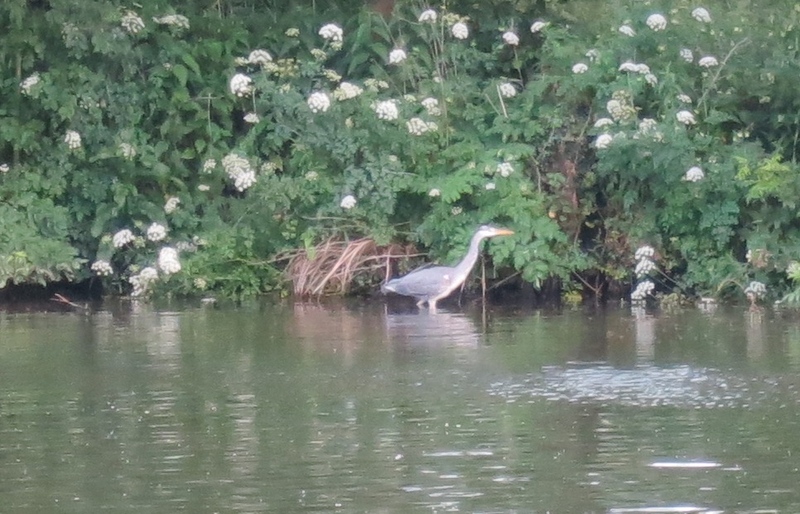 I eventually realised that a ‘hern’ is a heron, so here are ……. 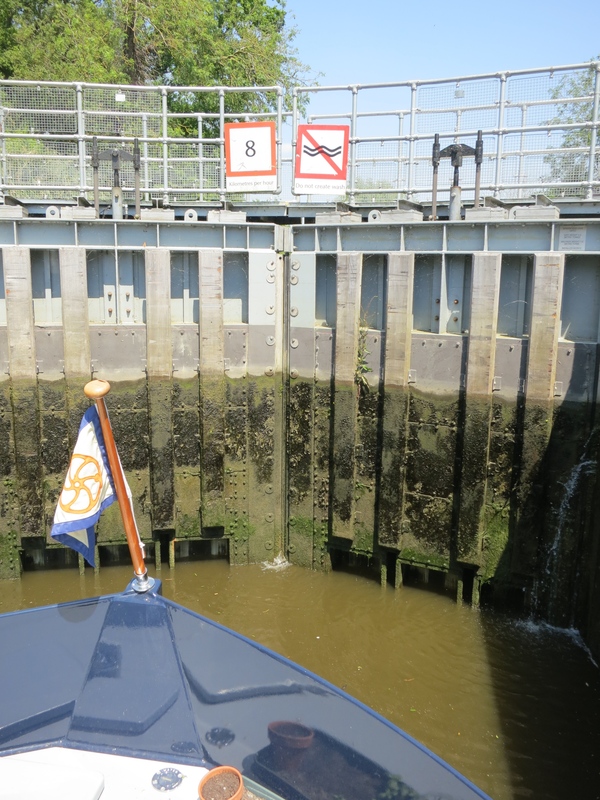 It’s great when we get to be at the front of a BIG lock going upstream. It’s the closest I get to white water rafting when the sluices are opened! Hard to get a photo that even begins to convey this, but these few at Benson Lock give a slight feel of the calm and storm of the action! The calm – moving towards the lock …..
….. the stillness within the depths of the lock. The storm – a deluge, nay a torrent, of water pours through the sluices from above. Calliope rocks and heaves on her ropes …. …. 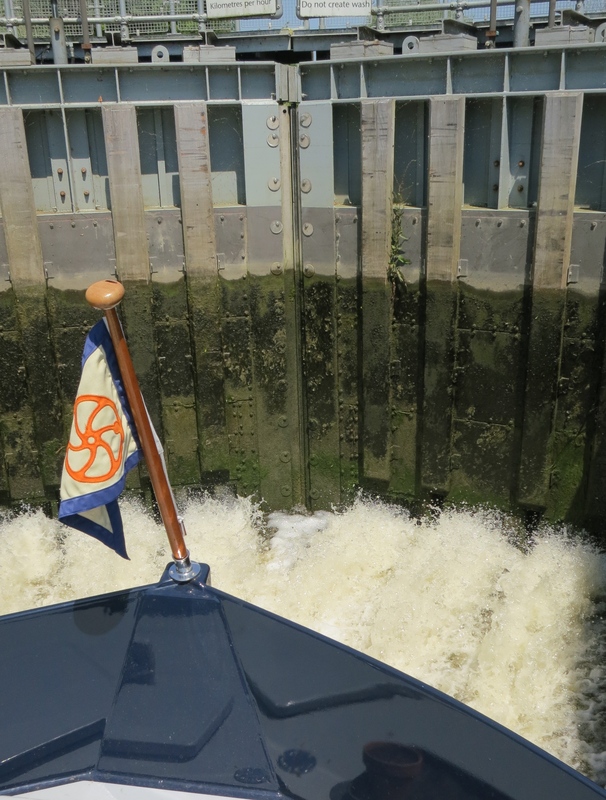 until we float to the top of the lock and gently move out onto the next reach of the Thames. Lock jams, boat jams and traffic jams with some bridges and animals. It’s a bit different here on the upper reaches of the Thames (or should I say Isis?) 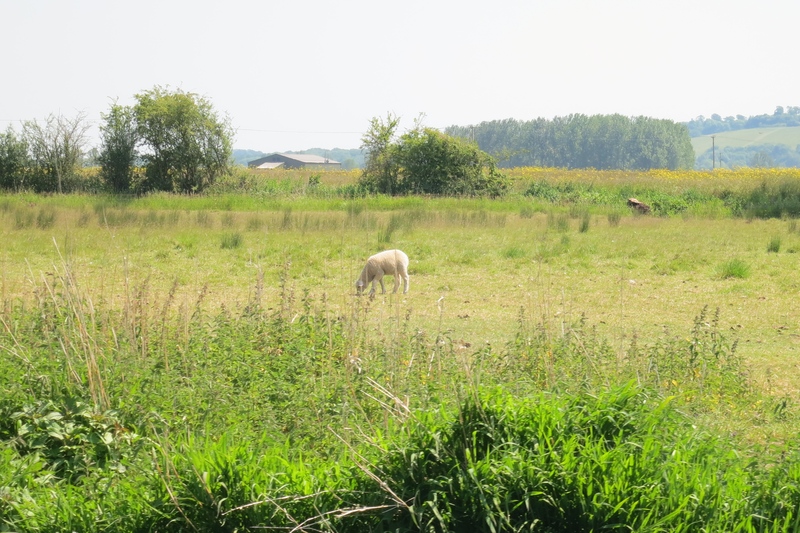 The scenery is flatter, more meadows …. and, a delight for me, more farm animals. (I can lay off Farmville and Smurf Village for a while and get my rural kicks for real). Stewart kept calling “Cow!” and I rushed for the camera – all colours, sizes and ages. We arrived to find ‘Jam 1’ – a boat jam. Every possible mooring place was jammed full and there was no room for Calliope. 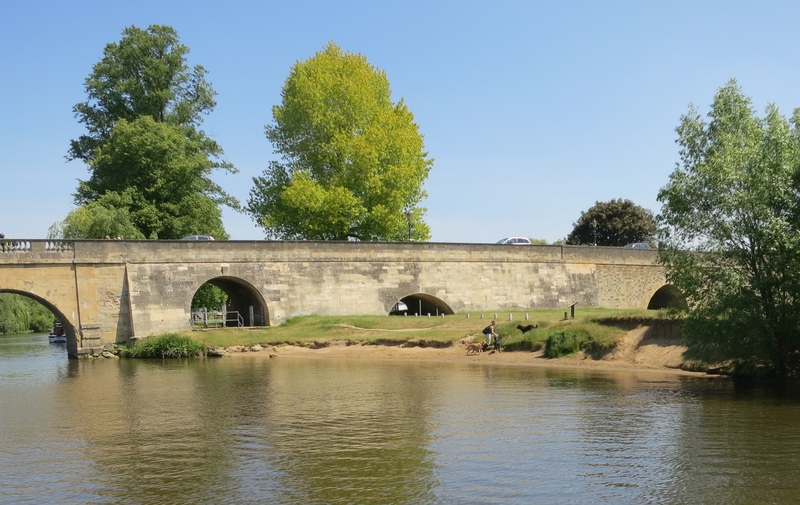 Disappointed, and hungry, as lunch was to be prepared and eaten at Wallingford, we pottered on upstream looking for somewhere, which became ‘anywhere’ to moor. Eventually. 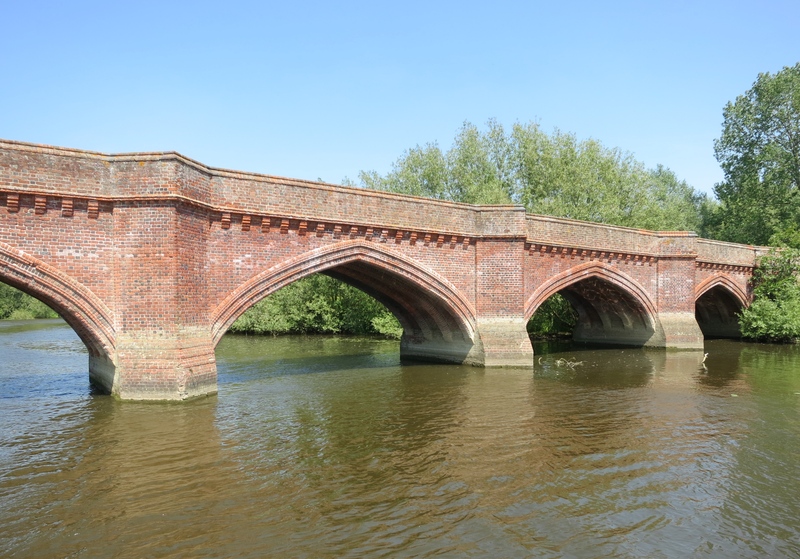 eating as we pottered, we came under my favourite bridge so far – Clifton Hampden – and here it is …. Beautiful, but will Calliope fit through those gothic arches? Yes, a perfect squeeze from the Captain saw us pottering on. And this bridge became the site of ‘Jam 2’, the traffic jam. Walking up to try out the local beer (Hook Norton) at The Barley Mow we found the bridge jammed in both directions, apparently due to an accident nearby. How wonderful to walk across in the early evening sun and sit in the pub garden watching the jammed. Smug? No, appreciative of our new life style. 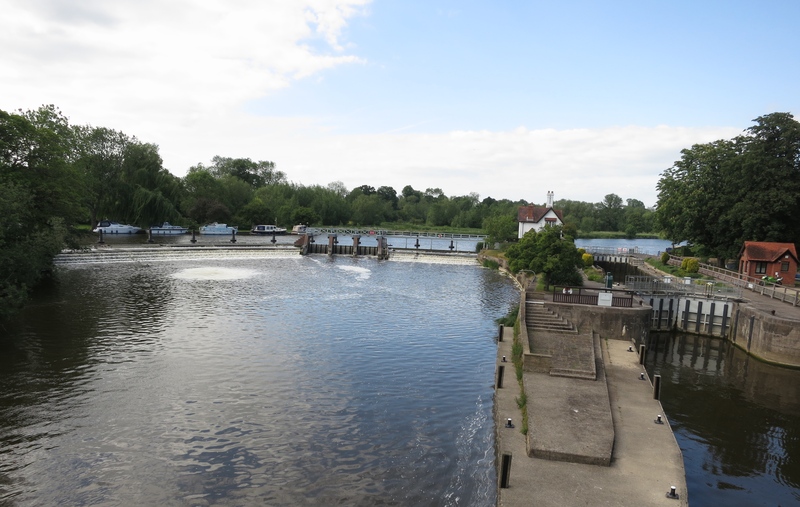 The final jam, ‘Jam 3’, occurred at Culham Lock this morning – one of the deepest locks on the river, and today un-manned. This means self service, with quite a lot of boats gong in both directions, some of whom are not familiar with operating the locks. One boater managed to upset the lock operating system which itself jammed (oh, Jam 4! ), thus resulting in a very slow filing and emptying of the lock. No photos I’m afraid. It was raining a bit, and also required lots of concentration to have ropes in the right place at the right time. But we did meet a nice man who lives on a barge at Limehouse and is cruising up river on his very pretty old motor launch, with his cat. The cat wears a life jacket and a lead, and came with his owner onto Calliope for a cup of tea while we waited and waited for the jam to clear! Now at Abingdon. Want to see their bridge? 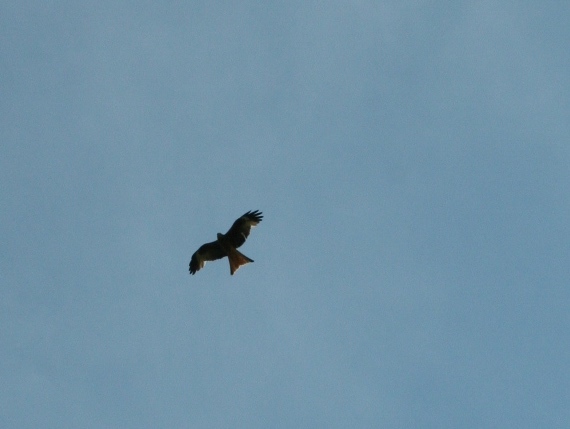 The red kites between Wallingford and Goring have been a bit easier to photograph, although they are still able to tease by sneaking out of the frame just as I click the button on the camera! 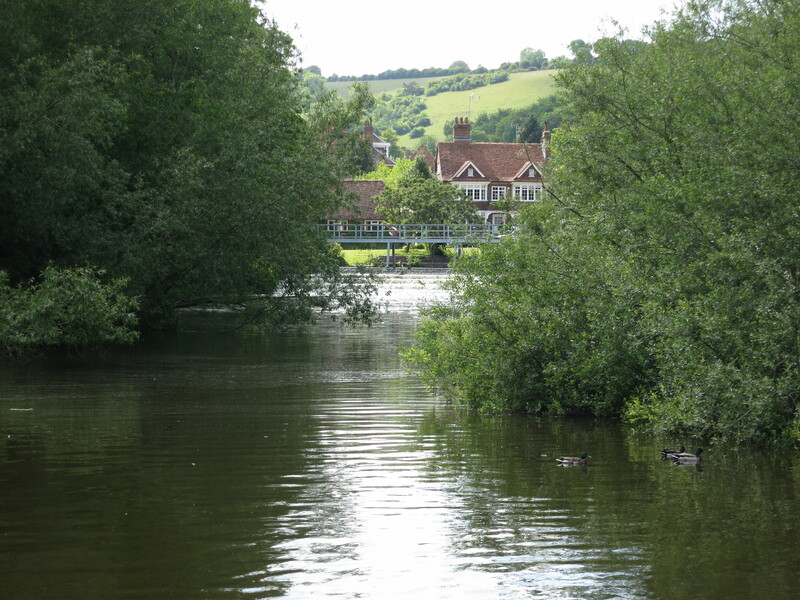 with views from the bridge (over to Streatley) …..
…. 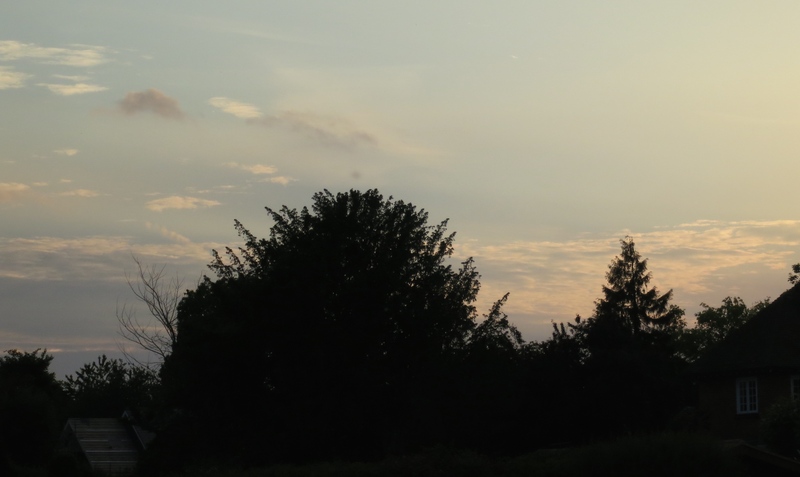 views from the back deck …. Hold on, something’s missing …. Ah yes, Captain and crew! We like it SO much we came back again with Peter and Aileen. It was great to have Aileen as a fellow photographer (she does it properly!) 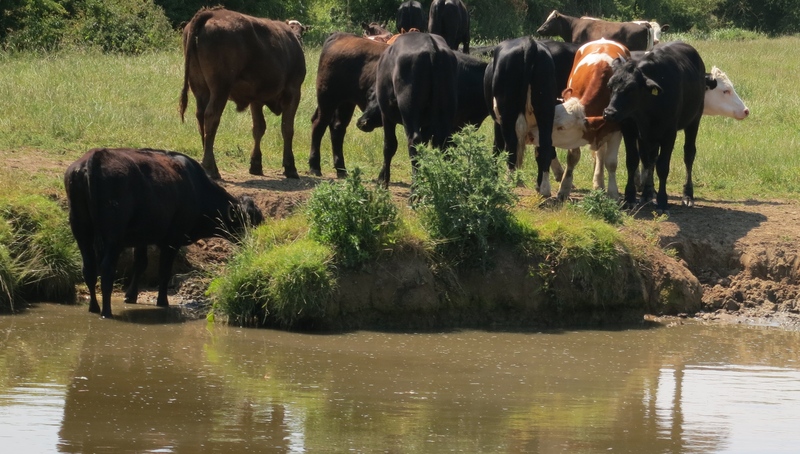 and to go for a walk along the bank snapping some of the natural resources – flora and fauna. 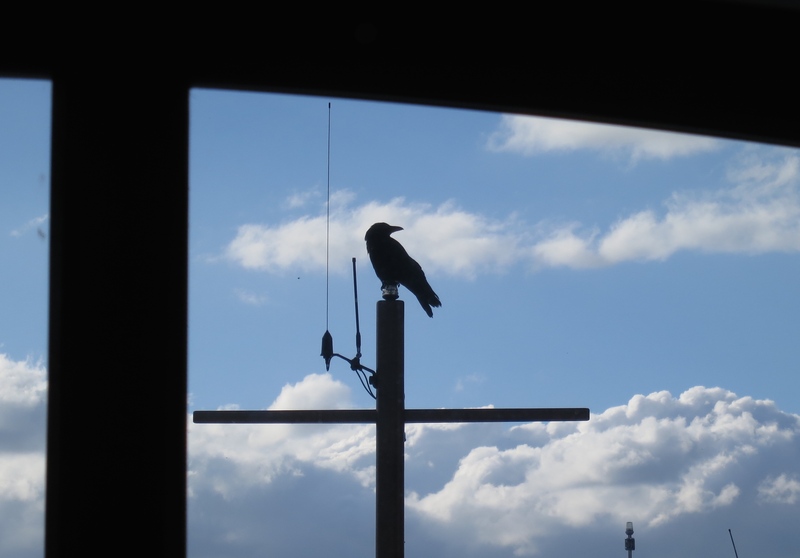 …….. if he is trying to build a crow’s nest on our mast? 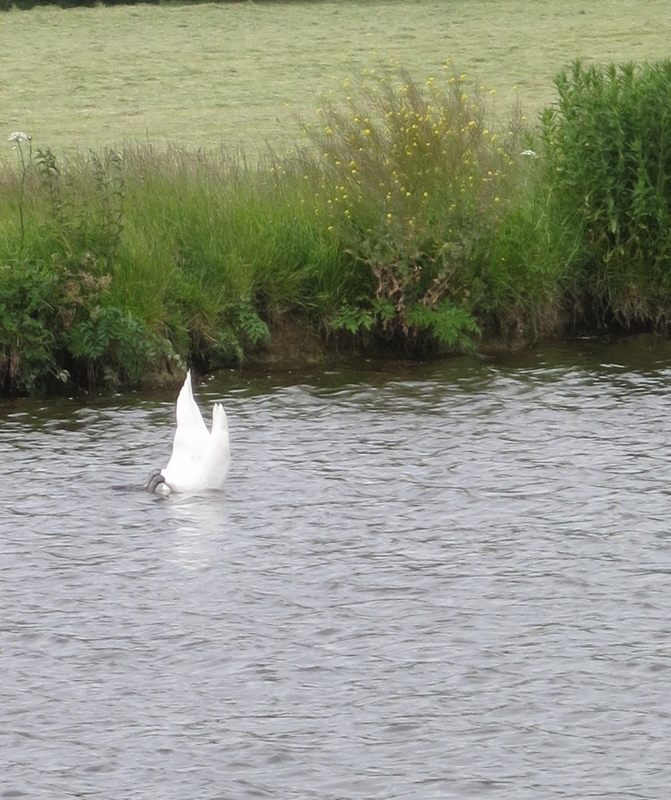 and if this is what is meant by swan upping?